Backup your entire mail server; easily recover any lost or deleted emails. 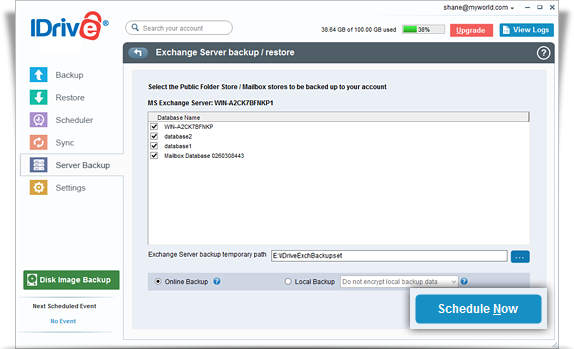 Backup / restore the Mailbox / Public Folder Stores (Storage Groups/Databases) of MS Exchange Server. 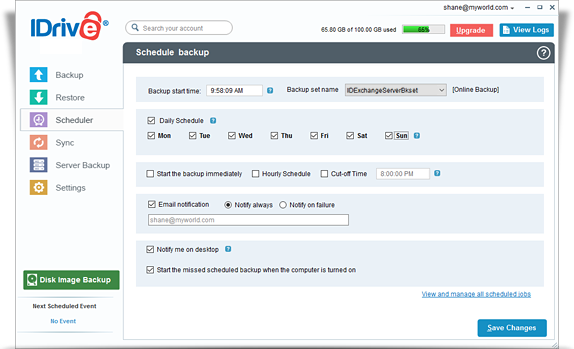 Backups can be scheduled for a future date and time with the various scheduling options. Enhanced security with 256-bit AES encryption on transfer and storage with a user-defined key that is not stored anywhere on IDrive servers. Email and Desktop notifications on completion of backup. Session based logs of backup activities. Login to the IDrive application and click the ‘Server Backup’ tab. 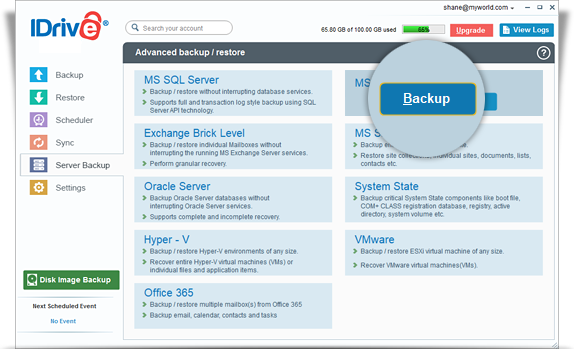 The ‘Schedule backup’ screen is displayed where you can schedule the backup for any future day and time or perform an immediate backup of the selected databases. Note: On successful backup of the MS Exchange Server databases to your IDrive account, the files are stored in a folder called 'IDriveExchBackupset'. It is not advisable to update or delete files manually as it may interrupt the Exchange Server restore operation. Also, avoid using the 'IDriveExchBackupset' as a destination folder for any other backup/ restore operation. View the steps to restore the MS Exchange Server.